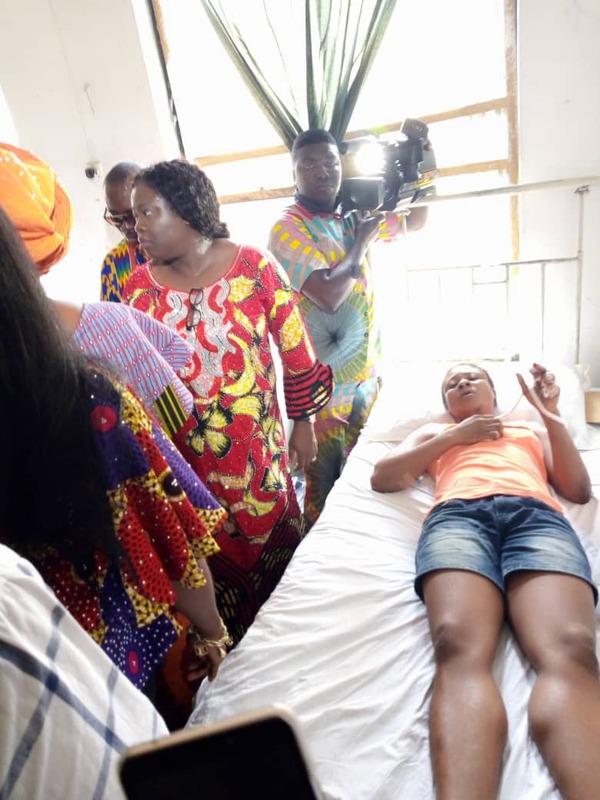 The wife of Abia State Governor, Deaconess Nkechi Ikpeazu on Friday in Aba said that the government of Abia State will foot every medical bills incurred during and after the treatment of Esther Ibemecha, a lady who survived attack my herdsman two weeks ago. The governor’s wife also said that the government is working hard to ensure that a repeat of such act is not witnessed in Abia again. Mrs. Ikpeazu who disclosed this during her visit to the victim at the General Hospital in Aba, consoled her and assured her that justice must be done. It will be recalled that ABACITYBLOG recently reported how a Fulani herdsman, Salisu Garuba who allegedly attempted to cut off the head of Ibemecha, ended up cutting off her four fingers in the process. The Abia first lady charged the hospital management to do all they can to put her back in good health. The Chief Executive, Hospital Management Board of Abia State, Dr. Ngozi Nduka said that efforts are on ground to pull specialists to see how the victim can still make use of her severed left hand. Speaking on the incident that brought Ibemecha to the hospital, Aba North LGA Chairman, Barrister Charles Esonu said he will put everything necessary to ensure that justice is not averted. “The procedure is that he has been charged to the magistrate court that doesn’t have jurisdiction with regards to the charge they brought against him. They’ll only refer the matter to the DPP and then he’ll stay in custody to await the next move. “I’m going to personally ensure that we follow the processes and the proper thing is done. Our criminal jurisprudence is apt to take care of such kind of situation. “I want to also thank the lady in question because it’s not an easy fit for to have carried that bleeding to chase after the man. I’ll also go a little further because I’ve called the speaker of Abia State House of Assembly and make some suggestions from my own quarters. “The suggestion that will see to enabling law that will take care of what led to this situation. I’ll be proactive to ensure that a certain bill will come in to address this issue within this locality and Abia State. Speaking on the anti grazing law in Abia, Esonu said, “That’s why I must see this speaker to make further suggestions because when they pass some of these laws, implementation is usually the case. “If we need to have a task force on the issue to make sure we prosecute offenders. It doesn’t just stop at mere law making. It Involves getting people arrested and charging them to court. We’ll do it within the law.